comment Experience what it's like to be an astronaut! Participants perform two spacecraft launch mission simulations using a full-scale Orion-style capsule and authentic Mission Control Center. They receive briefings about living and working in space and on Mars while teamwork, communication and collaboration skills are developed as participants take turns in the Training Control Center, guiding one another through a series of challenges. The five-hour experience is broken up into three, 90-minute sections detailed below. Participants will experience all components in each section. The ATX programme runs at various dates throughout the year. Morning and Afternoon programs offered. Check-in at the new ATX Facility right-hand side of the general entry gate at Kennedy Space Center Visitor Complex. Please Note: Your ticket does not include entrance to the exhibits at Kennedy Space Center Visitor Complex – you must purchase an Admission Badge or a Space Pass should you wish to explore these areas before or after your ATX Astronaut Training Experience. Please note, guests 'check-in' at the Visitor Centre to collect their tickets. Do I need to book a date for the ATX Astronaut Training Programme? 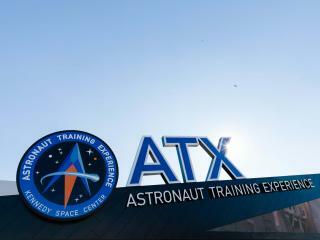 The ATX Astronaut Training programme is a reservation only experience so you must book at date at the time of booking. Does my ATX Astronaut Training Experience Ticket include access to the other exhibits at Kennedy Space Center Visitors Complex?